After their defeat in World War II, many fugitive Nazis recognized the potential of replacing the defeated Nazi German army with an Arab one. Adolf Eichman was no exception. Eichmann’s deep enthusiasm for such a strategy is revealed in the new book Eichmann Before Jerusalem by Bettina Stangneth. “I hold all commanders and other SS officers, responsible for the most scrupulous and loyal respect for this privilege especially granted to the Moslems. They have answered the call of the Moslem chiefs and have come to us out of hatred for the common Jewish-Anglo-Bolshevik enemy and through respect and fidelity for he who they respect above all, the Führer, Adolf Hitler. There will no longer be the least discussion about the special rights afforded to the Moslems in these circles.” Heinrich Himmler, on the formation of the SS Handshar ( Bosnian Muslim) Division, August 6, 1943. There are other interesting insights. According to Douglas Murray’s review of the book, Stangneth’s research revealed unexpected tensions that emerged between the efforts of Holocaust deniers working assiduously to create doubt in the minds of the public about the extent of the genocide after the war, and the immense pride Eichmann felt in his ‘accomplishment’ of having orchestrated the murder of six million Jews. Apparently, Eichmann was resistant to diminishing the magnitude of the “life’s work”, yearning instead for adoration and recognition for his ‘outstanding’ contribution towards eradicating the Jewish scourge on so massive a scale. … Stangneth shows that as an increasing amount of information on the Holocaust came to light in the 1950s the immediate reaction of the remaining Nazis and neo-Nazis in South America was denial. Some of the Argentina Nazis sincerely believed that the Federal German Republic would not last and that their belief system might yet return to save the German people. But even these remote fantasists realised that the news of the Holocaust presented problems for their rehabilitation. And so they hoped to expose the Holocaust. Their first attempts were not only crude but were swiftly overtaken by an unstoppable flood of information and scholarship. By the mid-1950s even the most committed remaining Nazis clearly found ignoring the weight of evidence to be an uphill struggle. And so this group of Nazis in South America, brought together by Sassen, thought that Eichmann might provide the solution to their quandary. 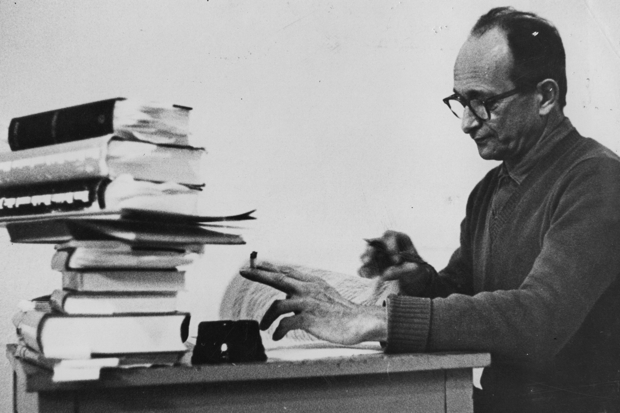 They believed that Eichmann would be able to help them not just because he had been the person most closely involved in the Nazi programmes against the Jews, but as the man cited at Nuremberg as having first used the six million figure. The Buenos Aires Nazis assumed that if they got Eichmann on record then they could show the world that the six million figure was a lie, or at least a great exaggeration. But the second reason why Stangneth’s book seems relevant for more than historical reasons is because of what it tells us about a stream of poison which remains very much at the centre of current events. Of course for years after the war there were rumours that Eichmann had fled to an Arab country. He might have had a better time there. Other Nazis certainly did, including Alois Brunner – Eichmann’s ‘best man’ – who settled in Damascus after the war and who is now believed to have died in Syria as recently as 2010. Eichmann’s Argentina years were certainly filled with frustration and rage. What is most interesting is how mentally caught he remained even before he was captured, principally by the impossible conundrum of how to persuade the world to accept what he had done and simultaneously boast about his role in the worst genocide in history. Tags: Eichmann, Haj Amin Al-Husseini, Holocaust deniers, Islam, Nazis. Bookmark the permalink. Pingback: Another solution to the failed Final Solution | Eichmann bet on the Arabs to complete the "annihilation"